So, as I got ready for my next field recording excursion I reflected on how much easier things are, now we have flash memory. I mean, what a great invention! Non-volatile, no moving parts, light as a feather, and tiny. Did someone win a Nobel prize for this? I hope so. It's also truly ridiculous how much memory I carry. For fun I thought I'd do a little inventory. On this trip I require a laptop, but will be travelling without an external hard drive for the first time. The reason? The two little thumb drives in the bottom of the photo (above). These are Samsung USB 3.0 devices. One is called the "Bar" and the other the "Stick", but they are the same technology inside. I got one of each so I could tell them apart. They are high speed and high quality, unlike the majority of memory on the market currently. You simply cannot trust manufacturer specifications and rated transfer speeds. These will do fine for backing up recordings from the laptop. But never has it been easier to lose 128 GB! I also have two Sandisk Cruzer Blade in 16 GB sizes (the red sticks), plus a couple naked SD cards, the 16 GB Transcend 10 SDHC 20 MB/s. To facilitate using SD cards, I carry an SD card reader, mostly because of brain-dead Macs. 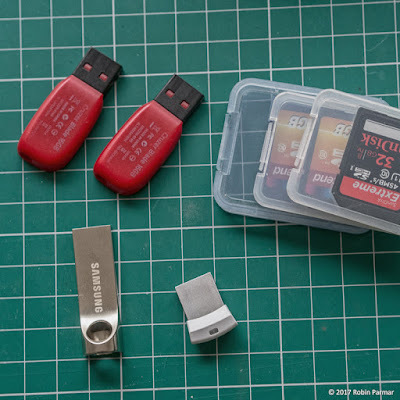 These smaller (ahem) sizes make it easier to backup material on a project basis. I also use them to transfer files to installation sites, when doing a presentation, etc. I plug these smaller sticks into unknown computers and devices, but I never do so with my two main Samsung backup drives. The reason? Viruses. It's easy for software nasties to travel from one system to another via portable memory. To help minimise the risk, grab yourself a free copy of Panda USB Vaccine and inoculate each stick and memory card. I don't have a web address for this software, since it keeps changing. It's also hard to find from the Panda website, so simply make an independent web search. Some devices are very choosy about exactly which memory they use, and there are lots of confusing terms to wade through. Besides which, manufacturers do not make it easy with their product naming schemes. You may wish to refer to my previous articles: Choosing An SD Card and Choosing a micro SD card for your phone. But, back to my memory bonanza. For my Zoom F8 recorder I have two 64 GB Transcend U1 10 SDHC-I 90 MB/s 600x. For my Olympus EP-5 camera I swap between two 32 GB Sandisk Extreme U1 10 SDHC-I 45 MB/s. For my Olympus LS-11 recorder I have a single 16 Sandisk Ultra 10 SDHC-I 30 MB/s. The recorder also has built-in memory, so I have redundancy. Adding this up, I discover that on a typical trip I carry half a terabyte of flash storage. That's ridiculous! But I suppose it would be even worse if I shot more video. P.S. Remember ZIP disks? Shudder. I do remember zip disks. So much excitement but dashed with reliability problems.